Paris, Paris? That's a long way to go for a Youth Conference! Yes it is, but can you put a mileage limit on your development? I can't! 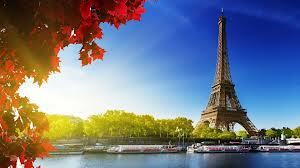 That is why I am heading to Paris this October. I love working with young people and deep in my heart I am desperate to be the best youth worker I can be. Not, as some might expect, so that I can get a pat on the back and feel good about myself, but rather: that the young people I work with deserve the best me I can be. Despite being an oldie and gaining my professional qualifications I still need to learn and grow, to be challenged, inspired and ultimately changed! I am both excited and expectant to unite with other Youth Workers from across Europe in the brand new and shiny Open Paris Conference and my over arching desire is to come away from this weekend different. By coming together as diverse people united by a passion for working with young people we can learn so much from each other so if you are not yet booked in you are affecting my learning potential! Travel really is easy, a few of us are travelling from Southampton Airport in fact it will take less time to get to this conference than it does to get to Eastbourne! So what's stopping you from joining us? I couldn't agree more. I myself am really looking forward to meeting with other youth workers from all over Europe to share ideas and encourage each other. Really looking forward to seeing you there Gemma!